The last two years of wildfires in California have been the most devastating on record. Last year 14 of the 16 wildfires were linked to trees falling into or touching PG&E power lines. This has led to an enormous number of lawsuits against PG&E from those impacted by these enormous fires—especially due to California laws which heighten the liability of utilities in situations such as this beyond the norm. The sheer damage and toll on life caused by these fires, and especially the fires in North Bay and Santa Rosa—have led to around 200 lawsuits leveled against PG&E. The costs of these lawsuits have been projected as high as $17B—in fact PG&E has already recorded at least $3.5B in losses after the fires. This year’s unprecedented wildfires have only added to this as they have ravaged California. This puts the utility giant in quite a pickle given that their insurance coverage only reaches around $840M. With such an enormous amount of money at stake, PG&E has devoted millions to seeking reform to current California laws regarding wildfires—limiting their liability, allowing them to pass on costs to customers or taxpayers, and offering alternative ways of paying for the wildfire costs. As of August 31st, the California legislature has granted the wish of utility giants such as PG&E—at least partially. A new bill has passed through California Congress, although it has not yet been signed by the Governor, that at least partially alleviates PG&E’s staggering costs. The bill, although not granting all that PG&E hoped for, is still enough that critics have been calling it a bailout for company. Those in support of the law, however, argue that it is critical to avoid sharp spikes in costs and ensure those damaged in wildfires can properly recover. Both sides of the argument have bipartisan support and, frankly, have some interesting arguments. Is California bailing out PG&E? 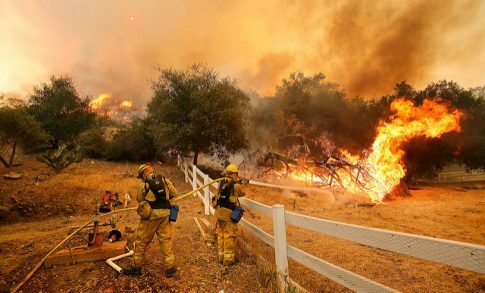 In order to fully understand the situation let’s look at the current California law on utility liability in wildfires, exactly what SB 901 does, and what we can realistically expect going forward. California law places a larger onus on utility companies than the average person or business when it comes to liability. Normally, a person can be liable for negligence when they cause damage to somebody by not taking the care a reasonable person would—or failing to follow a higher standard of care where a special duty exists. However, California holds utility companies strictly liable for property damage resulting from a fire caused by their equipment—regardless of how careful the company was. This is known as inverse condemnation. In general, the California Public Utilities Commission (CPUC) oversees reviewing these situations and often allows these companies to raise rates on customers across the board to recover the costs of these suits—so long as the company didn’t do anything wrong in terms of equipment safety or a similar issue. However, last November saw the CPUC denying such a request—San Diego Gas and Electric was asking for a rate raise to offset $380M in costs from a fire ten years ago. Perhaps more than anything, this set off the flurry of lobbying and the creation of the slew of bills that were ultimately amalgamated into SB 901. What Does SB 901 Do? While the utility companies originally lobbied for a complete rewrite of California’s liability laws for wildfires, SB 901 doesn’t go that far. The bill still grants them a great deal of financial relief—partially at the expense of Californians. SB 901 incorporates elements of quite a few bills addressing the issue of how PG&E could possibly pay its costs and avoid bankruptcy that have been introduced over the last several months. It passed with a great deal of bipartisan support—29 to 4 in the California Senate and 45 to 10 in Assembly. However, it’s actual terms have drawn a fair bit of outside criticism. The bill begins with quite a few steps to help prevent future wildfires, additional safety standards and the like. However, it moves on to the elements that have some up in arms. First, it makes it so the CPUC must look at the maximum amount a utility can sustain without harming ratepayers or going bankrupt for liability stemming from 2017 fires. This maximum amount is a sort of cap on liability. The second thing it does, also specifically for damages stemming from the 2017 wildfires, is allow utilities to pass the costs along to ratepayers though a process called “securitization.” This is a method of slowing down rate increases by having ratepayers pay off bonds instead of in one lump sum. This method can be used for anything exceeding the previously described cap the bill creates. Finally, for all fires after 2017, the CPUC will look at whether the utility companies have behaved reasonably—looking at factors from extreme weather to costs of changes to whether the utility company has complied with safety standards new and old. If they decide the company has been reasonable, they can pass on costs to you in a securitized form. The bill also takes a few steps that are less favorable to utility companies. It doubles the maximum penalty on utility companies for violating or failing to comply with CPUC rules or the California Constitution to $100,000 per violation—although the minimum remains $500. These penalties cannot be passed on to ratepayers. It also requires independent evaluators to ensure utility companies comply with CPUC plans for maintaining safe equipment—although the utility companies can pass the costs of this on to you. If a utility doesn’t do this, then they are fined, and the costs of these fines cannot be passed on. The utility companies also must prepare wildfire mitigation measures, which are independently reviewed for effectiveness. They also, as you may have heard in radio advertisements, must collaborate to assist fire fighters. Is SB 901 a Bailout? The bill is certainly going to save PG&E from a situation that could bankrupt the company. However, supporters of the bill say that that is sort of the point. The 2001 PG&E bankruptcy led to raised rates to pay off the $13B PG&E owed their remaining creditors. Supporters of the bill say that a bankruptcy would lead to higher rates just as surely as this bill will and would also leave those damaged by the wildfires in line to collect behind quite a few other creditors who came first. This isn’t totally just blowing smoke. The liability of the wildfires meant rates are almost certain to go up one way or another, with CPUC approval or due to bankruptcy. After last year’s fires, the insurance costs alone had already led to increases after the cost of insurance for these utility companies doubled. PG&E specifically saw nearly a 140% increase in insurance premiums. However, at the same time, the California Department of Forestry and Fire Protection (Cal Fire) says that there’s evidence that at least 11 of last year’s fires saw PG&E breaking state safety laws—essentially acting negligently. There’s a lot parse before that can be said for sure, but it raises the main point of SB 901’s critics. Are we bailing companies out after they caused fires across California by their own lack of care? Even under SB 901, the costs associated these negligent acts would not be able to be passed on to you. However, untangling the costs due to negligence from the other costs is not an easy task. No matter how you look at it, consumers will be footing the bill for PG&E to some extent. However, at least if you ask its supporters, SB 901 will make for a less drastic spike in your bills than a bankruptcy or a world without securitization a ratepayer protection bonds. Consumer protection advocates argue that this creates a permanent cycle of picking up the tab for utility companies. The unfortunate truth is that, regardless of who you ask, substantial rate hikes are in our future.